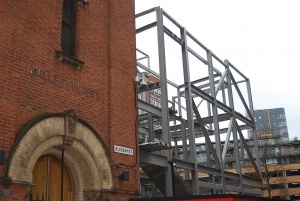 Manchester’s Hallé Orchestra is enlarging its St Peter’s rehearsal and recording facility with the construction of a steel-framed extension that will include acoustically-isolated practice spaces. 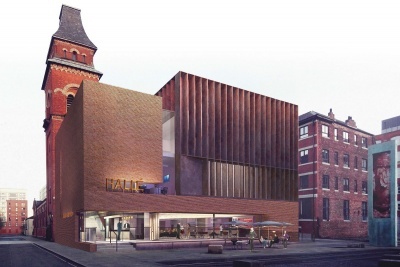 Located in Ancoats, a Manchester inner city district that was once the beating heart of the area’s cotton industry, the Hallé Orchestra’s principal rehearsal and recording space is undergoing a significant transformation. A new three-level steel-framed extension, to be known as The Oglesby Centre at Hallé St Peter’s will provide a brand-new façade to the existing facilities, which are housed in a former church, and front onto the adjacent open plaza of Cutting Room Square. The current work is phase two of Hallé’s overall vision, with the first phase being the restoration of St Peter’s church which was completed in 2013 (see below). Main contractor H.H Smith & Sons began on site for phase two in mid-2018 and initially excavated the extension’s basement. This lowest level is where the steelwork starts, and it will house offices, a kitchen, piano storage and other back-of-house facilities. 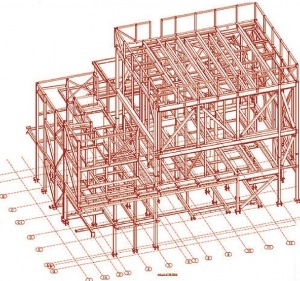 The steel frame’s columns at ground floor level terminate either at the perimeter capping beam or extend into the basement using a fairly regular grid pattern. The frame is primarily stabilised by two lift cores, one of which accommodates a piano elevator to transport the large instrument between the basement, the first-floor rehearsal space and into the existing building. Along the façade that abuts the existing building, the steel frame is also sympathetically attached to the church at certain points, giving the steel frame some more stability along with perimeter vertical bracing. The ground floor accommodates the entrance and café areas and the required long span column-free spaces have been created by using a series of 12m-long cellular beams. These pre-cambered members each weigh 1.5t, have a depth of 750mm and incorporate 350mm-diameter holes. The first floor (third-storey), has an 8m floor-to-ceiling height, much higher than the other floors as it accommodates the main rehearsal room, along with some smaller practice spaces. A large front elevation vertical truss, measuring 12m-wide by 7m-deep, creates the open-plan area for the rehearsal room while also allowing a column-free zone below for a large glazed frontage. The truss was fabricated from 533UB top and bottom booms and 250mm × 150mm RHS internals. It was also designed to be transported and installed piece small, which was an important consideration, not just for this truss, but the entire steel package, due to the confined site conditions. “There was only one location where our mobile crane could be sited to service the whole of the steel erection and this was quite close to the structure. Meticulous planning of deliveries and where erection could be completed was needed to ensure no area was left inaccessible,” explains BD Structures Director Chris Heys. 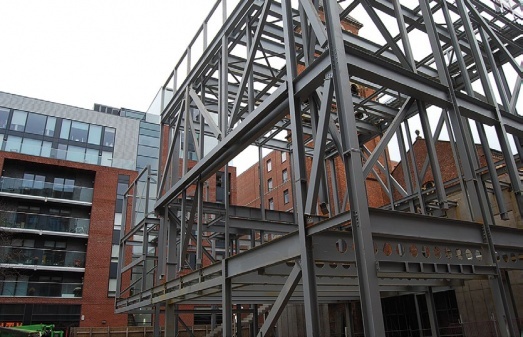 Being able to deliver steel to site in small manageable pieces was an important consideration when choosing a framing solution. However, the selection of steel for the primary structure was primarily driven by the need for large uninterrupted spans in the rehearsal, atrium and café space. “The steel solution was also more economic, reduced the construction programme, offered a more sensitive connection to the existing listed campanile tower, and can ultimately be recycled should the building ever be dismantled,” explains Mr Hollings. The form of the extension is said to be expressed as a robust brickwork plinth at street level that cradles the first-floor main rehearsal space. Most of the upper floor is clad with weathering steel fins, allowing light to enter the rehearsal area, while making an exterior reference to the industrial heritage of the local environment. The extension’s upper floor rehearsal room and two adjacent practice rooms are floating box-in-box spaces, which are acoustically-isolated from the primary structural frame and slab. This is to prevent sound transfer and ensure the highest level of acoustic performance in these key spaces. The boxes have their own compositely formed slabs, which are sat on acoustic pads and allow the spaces to be separated from the main first floor by a dividing and insulated void of 20mm. Installing the steelwork for these isolated boxes was one of the trickiest parts of the erection programme. 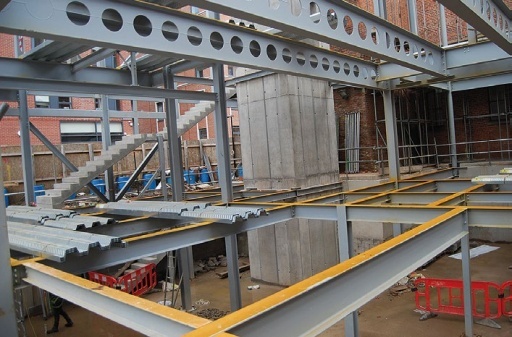 “As the boxes’ steelwork is not connected to the main frame, they were initially hung from roof level temporary supports, which had to stay in position until the slabs were poured and the boxes were supported,” explains H.H Smith & Sons Project Manager Mark Taylor. The rehearsal space box is formed with a traditional beam and column framework and measures approximately 20m-long × 12m-deep and 9m-high, while the two smaller practice rooms are constructed from light gauge steel framing system (SFS). The Hallé St Peter’s extension is due for completion in the final quarter of this year. Built in 1859, St Peter’s was the first protestant church to be built in Ancoats, which at the time was a predominantly catholic area, as a large proportion of the population was made up of mill workers from Ireland and Italy. The church’s iconic semi-circular apse was built to ensure the building’s prominence against the surrounding angular cotton mill factories. Internally, the structure is notable for being one of the city’s first to use cast iron columns. As the cotton industry declined and the local population decreased, the church closed in 1960. After a period of being left empty, in 2013 the Hallé raised funding to complete a restoration project and convert the church for use by the orchestra and associated ensembles. Interestingly, the Hallé, which is considered to be among the UK’s top symphony orchestras, was founded just one year before the church was built.